Okay. So I am writing this post via my newly downloaded pages. I tried and tried to get Googledocs to work, but I kept on getting an error message. I did manage to see the editing options when I switched to desktop mode, but it still wouldn’t let me edit it. So. 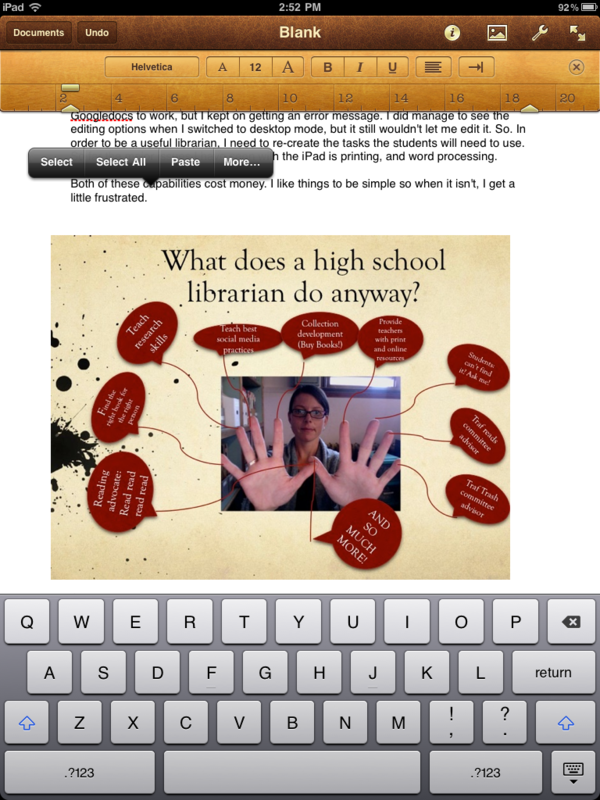 In order to be a useful librarian, I need to re-create the tasks the students will need to use. 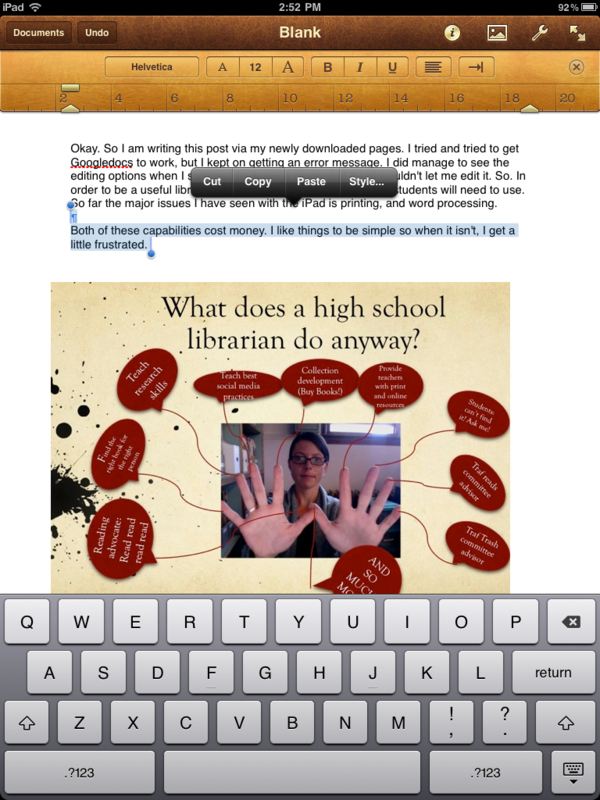 So far the major issues I have seen with the iPad is printing, and word processing. Both of these capabilities cost money. I like things to be simple so when it isn’t, I get a little frustrated. 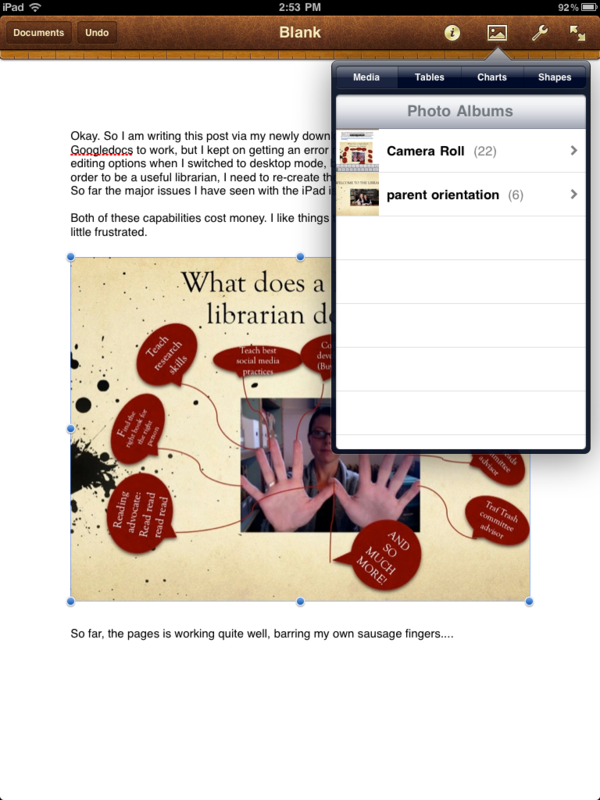 So far, the pages is working quite well, barring my own sausage fingers…. 1. 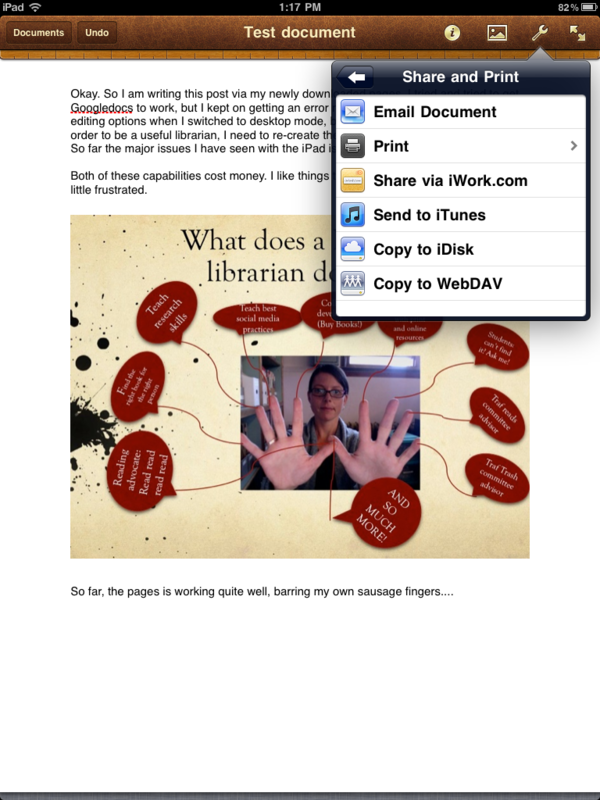 Tap the screen at the end of the text you want to highlight: ( had to switch to my desktop to write this as blogger on the ipad does not support inserting images, or the compose mode-it is html all the way). 3. 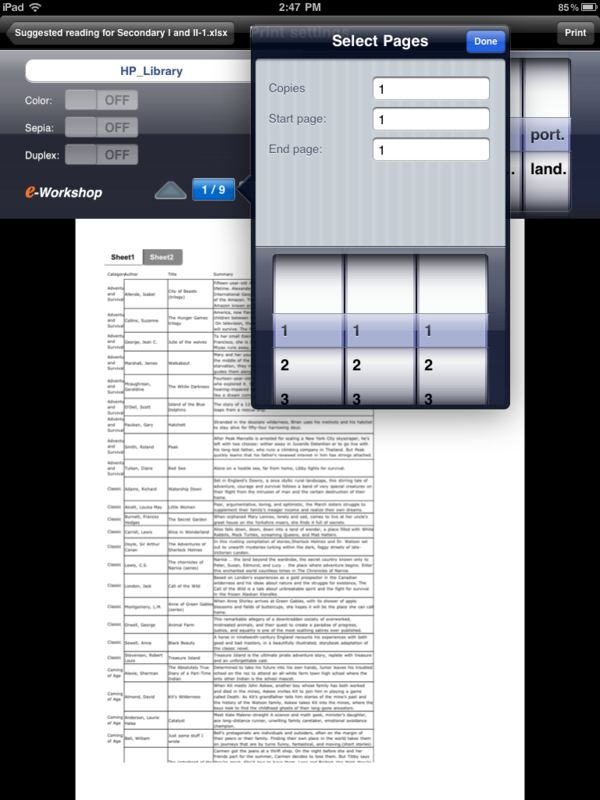 Click on the place you want to paste the text you selected (in my case it was in this blog). The paste option should show up. Paste! This is also where you will find the shapes (arrows, circles rectangles) as well as charts and tables. 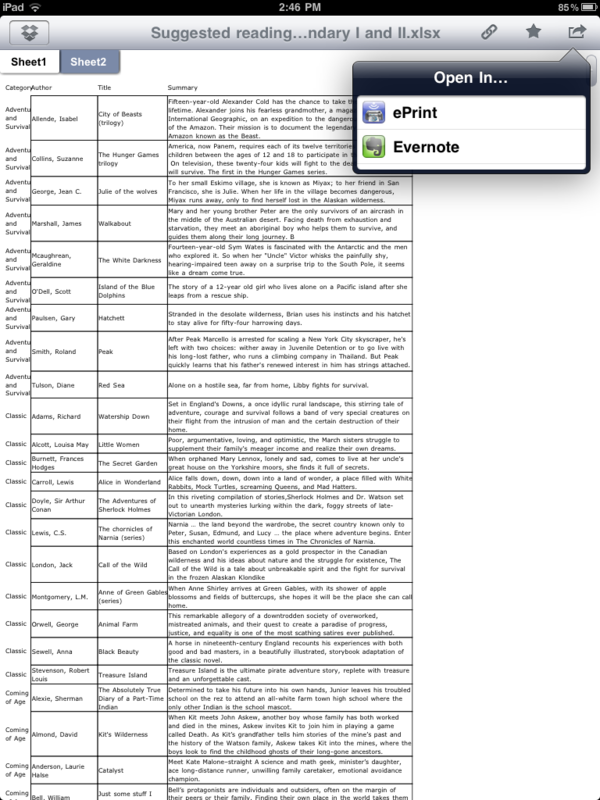 Now let me see if I can print my document…not easily with eprint…Hmmm. A question for tomorrow I think. I had two questions at lunch today from a poor student who could no longer access the internet because her safari screen had greyed out and wouldn’t let her do anything. After googling the helpful ipadforums, I found the answer. 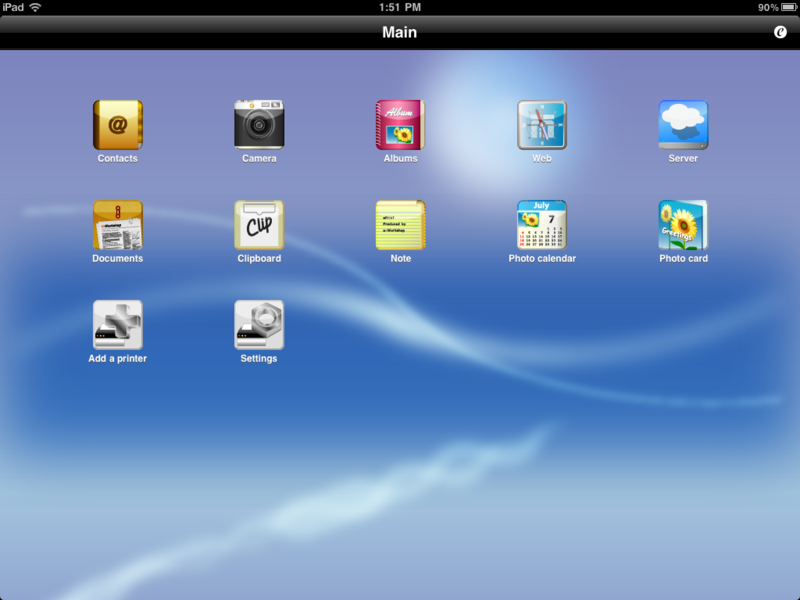 Reset it by pressing the on/off button and the ipad button in the centre until you see the apple icon. It will restart it and it should work when you open Safari again. It did for the student! Why does it do that? 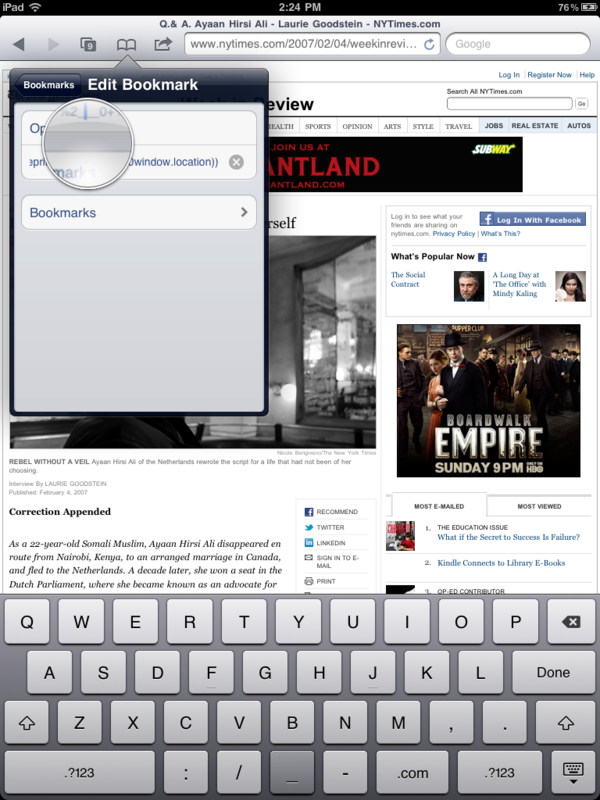 Who knows, but it does feel like the ipad version of when a computer freezes up ( a site takes too long to load, etc.) Perhaps our IT guru could weigh in? The second question was more difficult and required me laying down some cash. 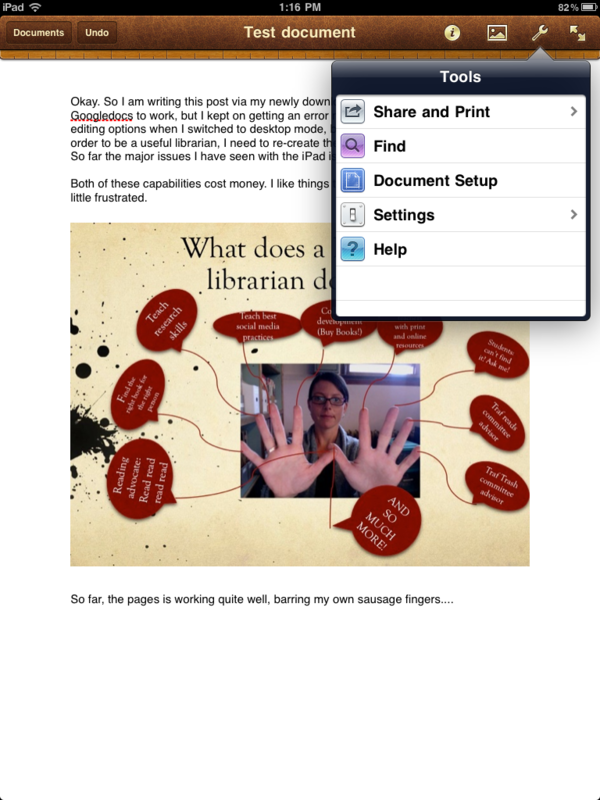 How do you print from your ipad? Hmmm. This is complicated as it depends on what kind of printer you have. 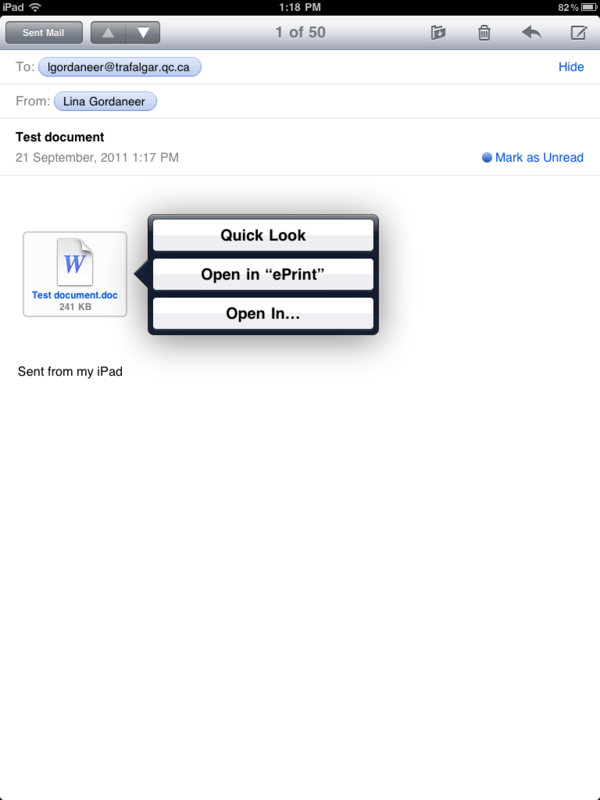 If you are lucky enough to have an airprint supported printer (which we are not), then you are good to go. However, we at the school are not that lucky. 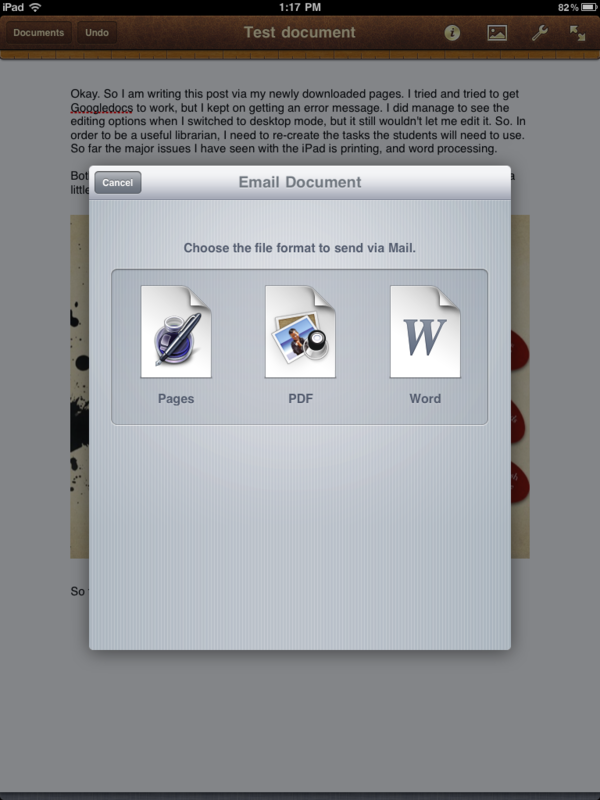 I found this very helpful article on printing on the ipad from Macworld that gave some options for printing without airprint. 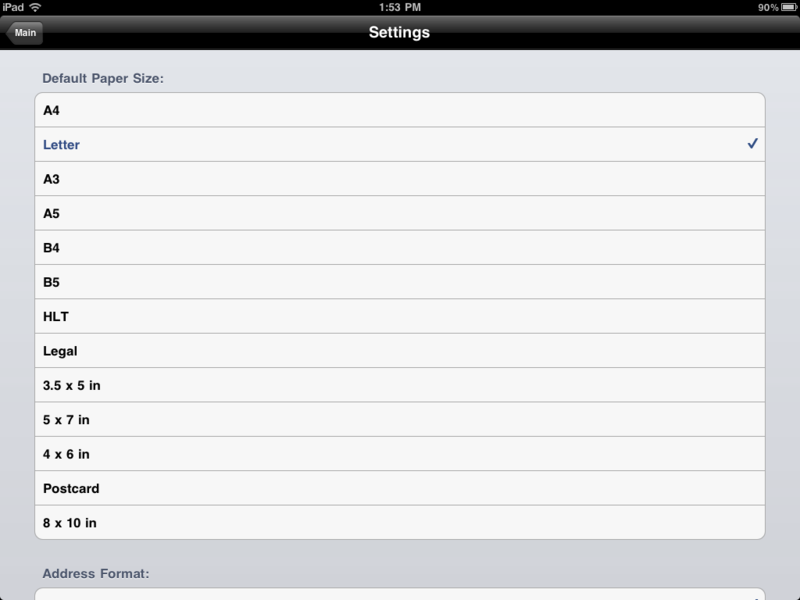 I, of course, chose the cheapest, eprint at a whopping 3$, my first app purchase. Then I went to the Add a printer icon and the library printer was already listed. I clicked on it and made it my default. Then I returned to main menu and clicked on settings, where I made sure the default paper size was letter, created a borderless extension area. Then I opened my dropbox to find a document to test it out on. To connect the document with the printer I had to star it and store it in my favourites. I then clicked on the framed arrow on the right hand side and it gave me the option to print. I clicked on print settings, made sure I was only printing the first page, made sure it was only printing the body and voilà! My document was printed!